Monday, July 14. I was awake and moving by 6:30 - had some coffee and got my laundry going and took Frisco for a nice walk. The mornings have been nice and cool and the forecast is for 70s through most of the week. I've had to use an extra layer of blankets during the nights. When the laundry was done, I headed out to Lake Kegonsa State Park to check out some sites for camping with Pat and Roger next week. A nice double site is available, so we've got a spot. Works where Mike's Grandfather and his Uncle Bill built and sold boats for years, is located across the river and is still in operation although it is no longer owned by the family. It was a nice afternoon. Pat made grilled sausage and peppers for dinner tonight. YUM! Tuesday, July 15. I was on the phone this morning with my cousins, Fran and Ken, trying to get us first cousins together for lunch. As far as I know, there are only 13 of our generation still living and 7 of us will be together on the 28th. I was telling Fran that Carole and Bob are here from Florida and they might be able to join us too. Just as I hung up the phone, Carole called. 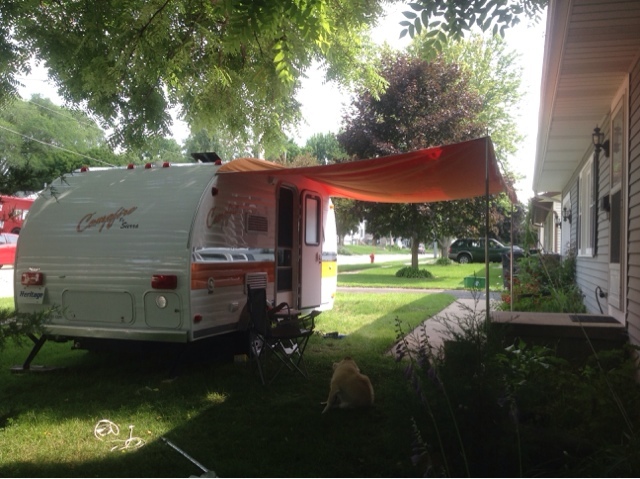 I learned that they have a 5th wheel set up permanently at the Lakeland Campground in Milton for the summer. It is only a short distance from Stoughton, so I headed over there and we had a great visit and a beer and a burger at the bar overlooking Lake Koshkonong. It has been a cold and rainy day - I even had to put long pants on and wear a sweater. Wednesday, July 16. My trailer looks like brand new after a good cleaning and wax from top to bottom. It didn't take any longer than it does to clean a car. It was only 52 degrees this morning - brrrrr! It warmed up nice once the sun came up and we took a nice, 2 mile walk. Thursday, July 17. Tom and Karen and Becky and Lizzy invited me to join them on a bike ride today. Becky brought Brooke's bike for me to ride (she is at camp this week) and we all headed out from Tom and Karen's toward Cherokee Country Club on Madison's northeast side. Before I had ridden a mile, I had my doubts if my body would hold out. We did make it to Olbrich Gardens where we stopped to see the memorial tree where there are leaves for Mom, Mike, and Dan - very nicely done. I made it about a half mile farther along the bike path but had to turn back after that. The bike was just too small and had no cushion in the seat - a very rough ride. I still had at least 2 miles to go back but I made it with a few periods of walking along the route. I did get my physical workout in today with the bike ride and about 40 minutes of walking with Frisco this morning. The only other time that I have seen a near naked man riding a bike was in Quartzite, AZ and it took me by surprise. Today, in Monona, I was surprised again. 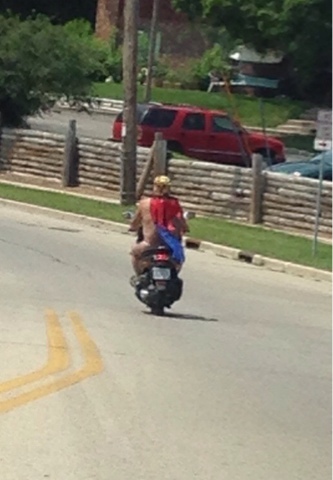 This guy was on a motorcycle, naked except for a thong and he was wearing a doo rag on his head and a cape. Strange! When I got back home I took a short nap and then I wanted to see if I could put the awning on the trailer out by myself. I did it! It's very nice, certainly retro, and very orange. It's going to work out just fine. Stoughton, as they were having city-wide garage sale (I'm addicted). As I drove along the country roads I was surrounded by a sea of green; fields of corn and soybeans, heavily wooded areas of oaks and pine trees, a pair of Sandhills Cranes flying over the road, the sweet smells if new mown hay, and all of this with a background of beautiful blue skies that were dotted with puffs of white clouds. Get the picture? Absolutely beautiful! I guess the scenery was my reward, as I certainly didn't come across the mother load at garage sales - a pretty basket and a couple of Pampered Chef items. I met Pat and Roger and some of his family at Nau-ti-gal in Madison for dinner tonight. I was so looking forward to a good Old Fashioned but Rog informed me that he had just had the worst one he has ever had in the entire state of Wisconsin. So we all decided to get a pitcher of beer and they didn't have any of those that we all suggested but the once that we settled on was good. I was beginning to wonder if the meals were going to be messed up - they sure didn't have the bar very organized. The standard fish fry was delicious though and we had a great time sitting on the patio facing the river. It was a very nice evening with friends. Saturday, July 19. It was off the grocery store this morning, time to stock up on a few things for camping next week and also to get ingredients for lasagna for tonight's dinner. I got that all ready as soon as I got the groceries put away - and I managed to find space for everything. I walked over to Dawn's house, as her daughter, Adriane was going to be there with her 2 kids, Lyla and Noland. What a surprise to also see Dawn's daughter Kate, who just finished getting her Physical Therapy degree in England. They were expecting her home in the next 2 weeks but she was being very evasive about her travel arrangements. Right behind her was my cousin, Theresa. Lunch was prepared and we all enjoyed a nice visit on the patio. When I got back to Pat's house, I got to meet his friend, Mark. Now, I've heard a lot of stories about this friend from Germany, so it was nice to finally meet him - a cheerful, polite, and fun guy to talk to. We enjoyed a beer in the back yard and then we all had dinner together - Tracey's Mom, Donna also joined us. My lasagna was a big hit! What a pleasant day!